Most of the traders do not find the Bollinger Band technical indicator as effective as it sounds or explained by the thousand of written articles online. 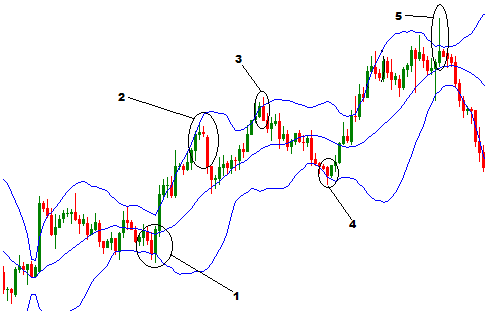 Traders very commonly place orders basing on the principle of trading with the three bands of Bollinger Band. And they found the indicator is not that much effective to relay on it every time. However, I am writing this post to explain the way to trade with Bollinger Band and candlesticks patterns , to make some profitable trades. The combination of these two tools can be considered as a simple effective trading system. Let me explain how the Bollinger Band and candlestick patterns can be applied to make an profitable but simple trading system . We already know that with Bollinger Band technical indicator a long entry is suggested when the price touches the lower band of the Bollinger Band, and a short entry is suggested when the price touches the upper band. When we are trading with this system , we will keep the aforementioned principle in our mind. In the above image, we marked some candles when the price touches either the upper band or lower band. We marked six candles or group of candles on the above price chart. In the first situation (1), we can see price touches the lower Bollinger Band, and the green candle covers the body of the previous two candles. If the two bearish candles are added together and considered as a single bearish candle, the pattern can be considered as a spinning bottom candle sticks pattern, which indicates a move toward bullish direction. In the second situation (2), the price touches the upper band, and a long green candle followed by a candle with a long upper shadow. These two candles together in this form are very similar to the shooting star candlestick pattern, which indicates a bearish trend. In the third situation (3),the price reaches the upper band, and the pattern is not clearly recognized, but the healthy long green candle is completely covered by the following red candle. These two candles are very similar to spinning top or bearish engulfing candlestick pattern, and they indicate bearish trend. In fourth situation (4), the price touches the lower band, and there is a red candle with long shadow, and the body of the candle is completely covered by a green candle. The long upper shadow candle itself indicates a bullish signal, and the following candle covering the body of the long shadow candle adds more strength to the signal. In fifth situation (5), the price touches the upper band, so usually the Bollinger Band indicating a short entry. At that point, we can see a long upper shadow candle, which reconfirmed some bearish steps of the market. Dear Traders, before trading with Bollinger Band technical indicator and candlestick chart patterns, we have to first learn the different candlestick patterns and their role in trend. Actually, identifying the candlestick patterns on the upper and lower band of the Bollinger Band can open very profitable trading opportunities. Commonly, traders may not find the candlestick patterns exactly as they learned, but smart traders can identify how similar the found pattern to the learned pattern. You can buy a book to learn more about candlestick chart pattern .